You just gotta love Lewie. Leave it to a lich to present a proper Bulworth Speech to this bunch. Sometimes, you need a honey badger to spell out the facts of life. That good old Lewie. Such a way with words! That’s right! The WoodElf Queen has two children, Glitterbranch and Dewcup. Glitterbranch has one child (that we know of), Cadugan. Rich – does Dewcup count as "one"? I mean…she’s more like two, or not? Cy’x, well, technically, Queen only gave birth to one Dewcup. The other’s more like a child of Dewcup and Arachne. 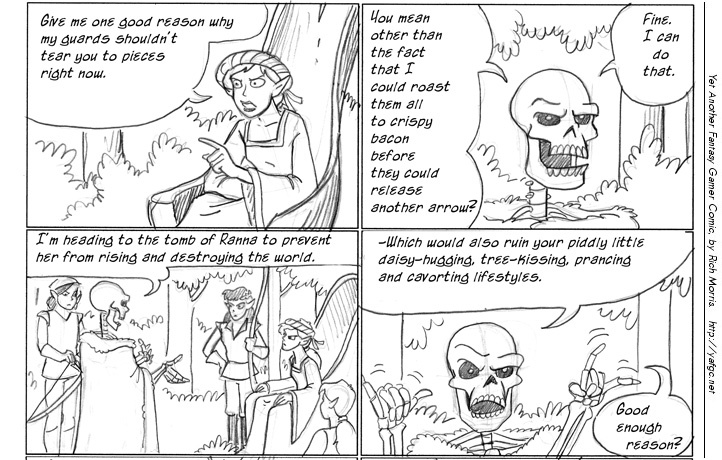 Either that, or telling the Wood Elves what he is up to is his way of disseminating misinformation, and luring Ranna into a trap. How does Lewie manage to raise his (nonexistent) eyebrow in frame four? You mean the magical, undead, hugely powerful wizard? He’s a lich. What more do you need? He is a lich, of course he has the spell "Animate Dead". His choice of hand signals in Panel Four fascinates me. Throwing the horns with the left (rather than the right, naturally) and then the Shaka sign (aka Hang Loose) with the right. Visual demonstration of their options?